Until recently I drove a Mazda 626, but it was 10 years old and the costs of maintenance were increasing to the point where it competed with payments on a new car. Things like transmission failures and timing belts and cooling system problems were becoming more popular than I liked. Although I loved that car, and paid whatever it took to keep it healthy, I knew it was time to move on. Hybrid cars have been around now for some years. Toyota's hybrid model, the Prius was one of the first available in Canada. I read that David Suzuki bought the first one in Canada. Since then other manufacturers such as Honda and Ford have come out with hybrid cars. While all this was happening, I was sitting on the fence and thinking to myself that one day I will get a hybrid car. I was waiting for the technology to mature, and work out the kinks and for the cost to come down where I could afford such a vehicle. Another important thing to bear in mind is the support infrastructure. Do your local dealers have experience in maintenance for hybrid vehicles? If you consult the owner's manual, you will see the schedule is quite different from a non-hybrid model. Can you get parts reasonably cheaply and without needing to have parts shipped from the other side of the country? And of course, if you call roadside assistance or were in an accident and needed emergency services, do they know how to deal with a hybrid car? To get answers to all these types of questions, you want to talk with people who own a hybrid car. I am concerned that magazine reviews are written by writers who don't own a hybrid, but just did a brief test drive, and then they regurgitate the data provided them by the car manufacturer. The best sources I found were on the internet, where there are discussion forums for owners of hybrid vehicles. You can even narrow it down to owners of the car(s) that you are considering. You can then ask them questions and get their feedback. As this year was the year I would be buying a new vehicle, I had to decide if the time was right. You see I normally buy a car new and keep it for about 10 years, or until it is cheaper to replace it than repair it. So if I did not buy a hybrid now, it would be another decade before I would be in a position to consider a hybrid. I decided that I was ready to go green and own a hybrid. 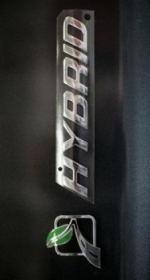 Since the early days, the price has come down But, there is a premium for hybrid vs. comparable non-hybrid models. In my case around 4-5K difference. Fortunately, in Canada, like in other countries there are tax incentives for hybrid cars. There are an increasing number of hybrid models out there. Obviously the front runners were Toyota and Honda and also Ford. 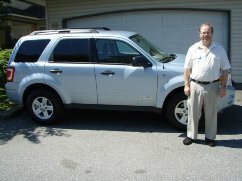 I looked at my criteria and the choices available and chose the Ford Escape Hybrid. One of the non-technical factors was that I knew a friend Gene, who worked at the local Ford dealership. Having someone who you trust is important to me. Other factors at the time included being able to carry kayaks, up to 5 passengers and lots of gear. Fuel economy is an interest to all of us, especially with the increasing cost of fuel. In Canada it is expressed in litres per 100 kilometers, and in the USA it is miles per gallon. Either way, you are trying to get further than ever before on a tank of gas. I know there are some people who argue that it costs more to create a hybrid vehicle, combined with the later cost of disposal of the batteries at the end of life of the vehicle. I am not qualified to comment on that. From what I see though, I am not convinced. There are also those folks who say the best fuel economy is to not own a car at all. For me that choice is not practical. Since buying a hybrid car, I learned how you drive has a big impact on how much fuel economy you can achieve. Rapid acceleration and speeding can burn fuel more rapidly, as does driving uphill. The best results are when you are burning no gas, and running on electric. This happens mostly at lower speeds and on level or downhill stretches of road. I also have more appreciation for long distance truck drivers. Since fuel is a big part of their costs, they drive in a way to use the least amount of fuel, which matches what I just said above. Also check your air pressure, as that can have an impact on your fuel economy. As a hybrid owner, I now allow more time for driving so I can go more slowly, and I try to plan my route so that there are less hills and more smooth flat stretches where I can 'glide' along, enjoying better fuel economy. This is an ongoing thing for me, learning ways to get more fuel economy. I like that the car uses the motion of the vehicle to recharge the batteries, while slowing down. There is a cool little meter on the dash that shows the battery being charged when I put my foot on the brake pedal. I expect to be replacing brake pads less often because of this. Non-hybrid cars use the brakes to convert motion into heat, which is wasted energy plus the expense of replacing the brake pads more often. Because the gas engine is not running all the time, it goes longer between services. For example my manual says 10,000 miles or 16,000 km between oil changes. The engine should age more slowly, although I don't know much about the life of the CVT transmission or the electric motor. It could end up to be a trade off in some way. An electric motor generally needs less maintenance than a gas engine. I already put in a K&R lifetime air filter. I read reports that it not only gave you more power, but can improve your fuel economy. Another benefit, not mentioned yet, is the reduced emissions compared to a non-hybrid model. In BC we have emissions testing, know as Aircare, and my car has an 8 year exemption - something to appreciate. This saves me in testing fees, plus the hassle to wait in line for testing. From the eco viewpoint, I like that my car is putting out less into the atmosphere.